I actually put the carrots, celery, onions, mint, curry leaves and chilies in the food processor to make quick work of the mincing (it's hard to chop this much veggies :-)). You want them to be textured. In a large pan fry the carrots, celery, onions, mint, curry leaves and chilies and all other veggies. When the vegetables soften add the ginger and garlic and saute for another 2 minutes. Then add the garam masala, cumin, turmeric and salt and saute for several more minutes. Cook the water out that the vegetables will give off. The mixture should be dry. Taste for seasoning (this mixture will be a little strong, but it will balance out once mixed with the meat). Allow the mixture to cool down. In a separate bowl mix the bread and milk together and crumble, after few mins squeeze out the extra milk. Then add the ground meat, squeezed bread, egg, parsley and some additional salt and pepper. Mix the masala vegetable mixture and crumbled Paneer (if using) with the meat mixture. 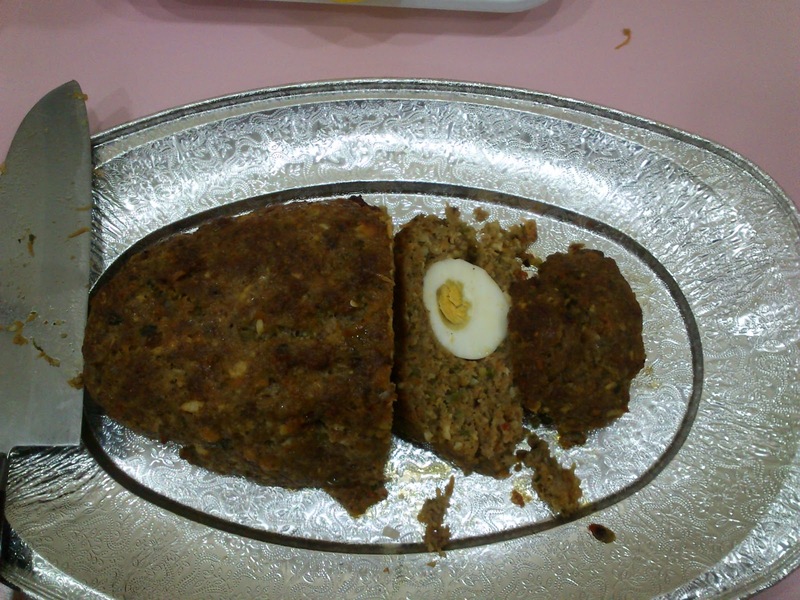 Free form the meatloaf mixture with the boiled eggs placed in the center of the mixture in a baking tray or loaf tin. You can cover the baking tray with some foil after spray the loaf with cooking spray or oil first. Once the meatloaf is formed into a loaf, place in a 200 C degree oven for 50-60 minutes until cooked. Left over meat loaf's make great sandwich's.